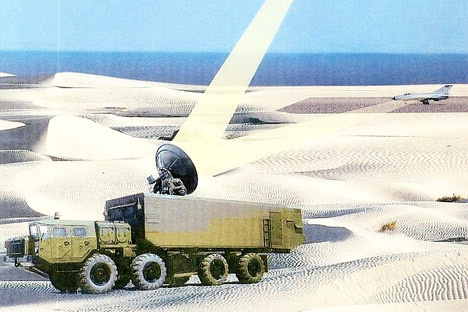 A new weapon, developed in Russia, operates on the principle of microwave radiation. The gun’s creators say it can take down drones and missiles from a range of around 10 km. Russia has developed a gun that operates on the principle of microwave radiation, the United Instruments Corporation (UIC) said in mid-June. The new weapon is capable of disabling enemy aircraft, drones and precision-guided weapons such as cruise missiles, according to its creators. The microwave gun was created at the Moscow Radio Engineering Institute, which is a military-run institution The device is able to operate at a range of around 10 km. From such a distance, the gun can disable a drone or a cruise missile. The super-high-frequency radiation emitted by the gun simply fries the electronic brains of drones, cruise missile warheads and combat aircraft. “In terms of technical specifications, this weapon has no known analogues in the world,” a defence industry source told TASS. However, he did not disclose the exact characteristics. The microwave gun was shown only to military specialists at a closed event during the Army-2015 defense industry show, held outside of Moscow in mid-June. Despite the veil of secrecy surrounding the latest weapon, experts are skeptical of the possibility of creating a microwave gun with such characteristics. The former chief of the Russian Air Force's anti-aircraft missile troops, retired Lieutenant-General Alexander Gorkov told the Svobodnaya Pressa website that it is quite difficult to put into practice the idea of a microwave gun that would reach the target at a distance of 10 km. In September 2001, at the LIMA-2001 International Maritime and Aerospace Exhibition in Malaysia, Russia demonstrated a project, which caused a great stir in military circles. It was listed in the register of exhibits as the Ranets-E mobile microwave radiation complex project. The uniqueness of the Ranets was in its “non-lethality.” It is a weapon that disables enemy equipment, but does not destroy it physically. The Ranets functioned like the microwave gun that is now being developed. It had a powerful directional beam of electromagnetic radiation and caused short circuits in electrical equipment and disabled sensitive electronics. The stated specifications of the Ranets was almost identical to the new microwave gun. The complex weighing 5 tons was supposed to hit the enemy electronics within a radius of 10 km and had a defensive capability of up to 60 degrees vertically and 360 degrees horizontally. However, despite its obvious advantages, the Ranets-E has not gone into service, even 15 years after the demonstration in Langkawi.